Hello and happy Friday! WOW! 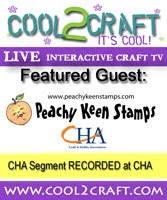 We've seen so many wonderful creations from the new Peachy Keen Stamp of the Month, and Peachy Picks Kit, and I've got another one for you. For this card, I used the PKSC-03 March 2012 stamp set, which is filled with the cutest little gnomes, and all kinds of little "gnomey" things to go with them. The stump, made into a sweet little house was what I chose to work with from the set for today, and I used a masking technique to add the mushroom and flower and grass around the bottom of the tree. The image was stamped with Momento Tuxedo Black ink and colored with Copic markers, and the card stock is from this month's Peachy Picks Kit. I even used a bit of card stock and twine from last months kit for this card. I love that I'm finding ways to use up all of the contents of these kits, rather than hoarding them up like I tend to do. They're so much prettier on display like this, rather than stashed away. Here's a little closer look. I thought that little mushroom made the perfect chimney for this sweet little house, and I cut some puffs of smoke out of white card stock to showcase the Gnome Sweet Gnome sentiment. The fabulous balsa wood tree, which is part of the Peachy Picks Kit was left au naturale, other than a bit of sponging on the edges with some Tim Holtz Distress Ink. I also inked the edges of the image panel with the same Vintage Photo colored ink. I actually used nearly the entire piece of green lace from the kit. I adds such great texture to this card, and is just perfect for a plush, grassy effect. I attached it with some red line tape by scrunching it up and sticking it to the tape as I went along the bottom of the card. The green resin flower tucked into the faux grass is also one of the wonderful elements in this kit. Thanks for stopping by today! Have a great Friday and a fabulous weekend!! Happy Stamping!! oh for the love of God. i quit. i can't say anything else. my brain no longer works due to awesome overload. This is beautiful! I love what you did with the chimney and the grass! Omg Lorie, your card is absolutely stunning!!! I just love everything about it.. This is the cutest thing I have ever seen!!!! SQUEE! This is so stinkin cute. I love that little house and how die you ever get the grass? Very cool. Awesome card, Lorie! I feel like I'm in the forest!! Love how you used the green lace...it really adds texture and dimension to this fantastic card! This is so very cute! I love living in a fantasy world and could move right in gnomes and all! This is just AMAZING!!! Can't believe how cute it is!!! This is awesome Lorie!! I love the rich colors and fab textures. Awesome job!! L.O.V.E! This card is briliant! The distressing is awesome, the layout and embellishments are fantastic and I adore how you did the sentiment. Another super fun card, Lorie!! This is truly Dimensional Eye Candy! LOVE everything about this little piece of 'gnome heaven'.